Original "mirin" is made from glutinous rice, rice malt and distilled spirit alone. Steamed glutinous　rice and rice malt are prepared together with distilled spirit, then squeezed, brewed and matured for a long time into mirin. 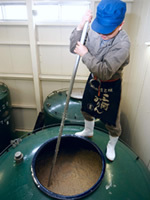 The good taste of glutinous rice is extracted by "brewing," a traditional technique from ancient Japan. As the alcohol percentage is around 14%, mirin is categorized as an alcoholic beverage under the Liquor Tax Act. Mirin is characterized by its mild, profound sweetness. Mirin that is good when drunk is genuine and best as a seasoning. Today, there are two manufacturing methods, a traditional manufacturing method, and an industrial manufacturing method. "Authentically Prepared Sanshu Mikawa Mirin" of Sumiya Bunjiro Brewery Co., Ltd. is made by the traditional manufacturing method. We use raw materials cultivated more naturally, and brew them in time-honored breweries to draw their natural flavors. / This method is a tradition of Japan. High-quality glutinous rice, a raw material, is steamed in a Japanese-style oven. Prepared unrefined mirin is saccharified and matured for a long time. This is the original manufacturing method for mirin using spirit made by simple distillation process (rice spirit). It takes two years to complete brewing and maturing. / This method has been used since the end of World War II. The use rate of rice starch and rice protein is increased in a short time by providing treatments, including pressure steaming and high-temperature liquefaction. White liquor or other spirit made by continuous distillation process is used instead of spirit made by simple distillation process. It takes 40 to 60 days to complete brewing and maturing.